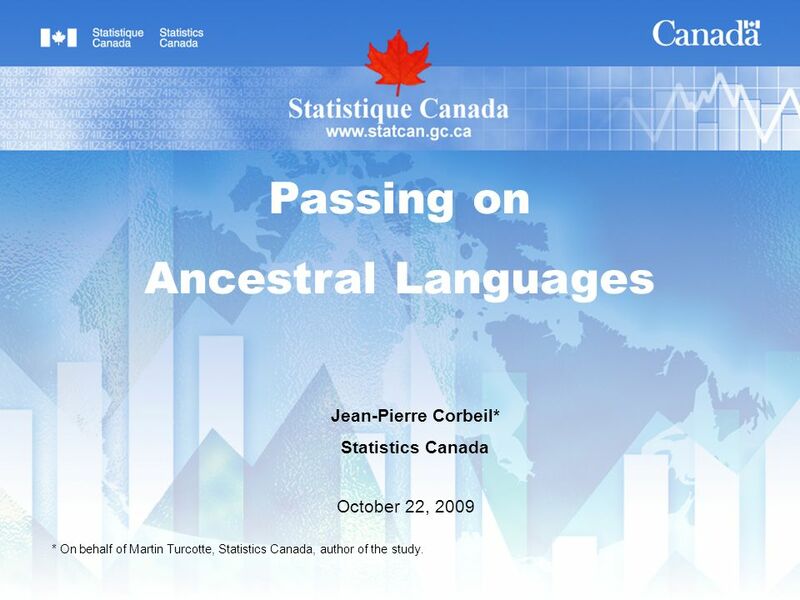 Jean-Pierre Corbeil* Statistics Canada October 22, 2009 Passing on Ancestral Languages * On behalf of Martin Turcotte, Statistics Canada, author of the. 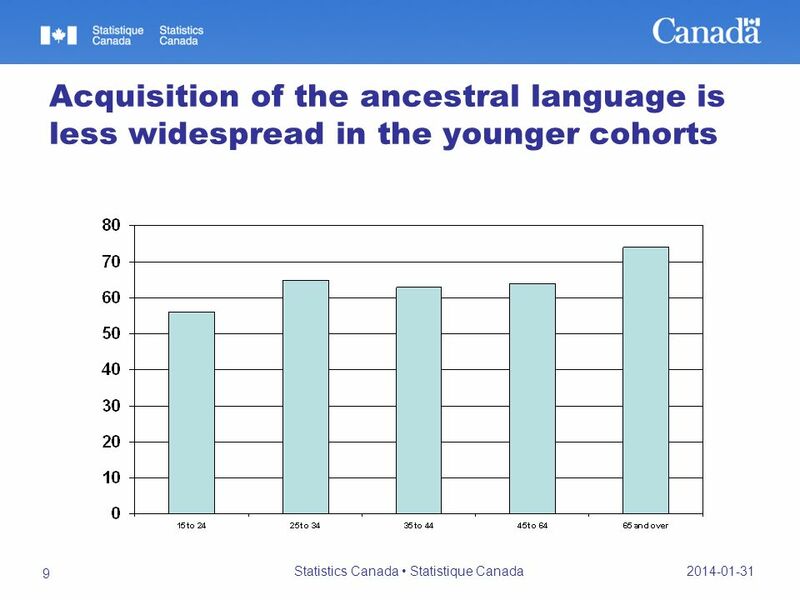 1 Jean-Pierre Corbeil* Statistics Canada October 22, 2009 Passing on Ancestral Languages * On behalf of Martin Turcotte, Statistics Canada, author of the study. 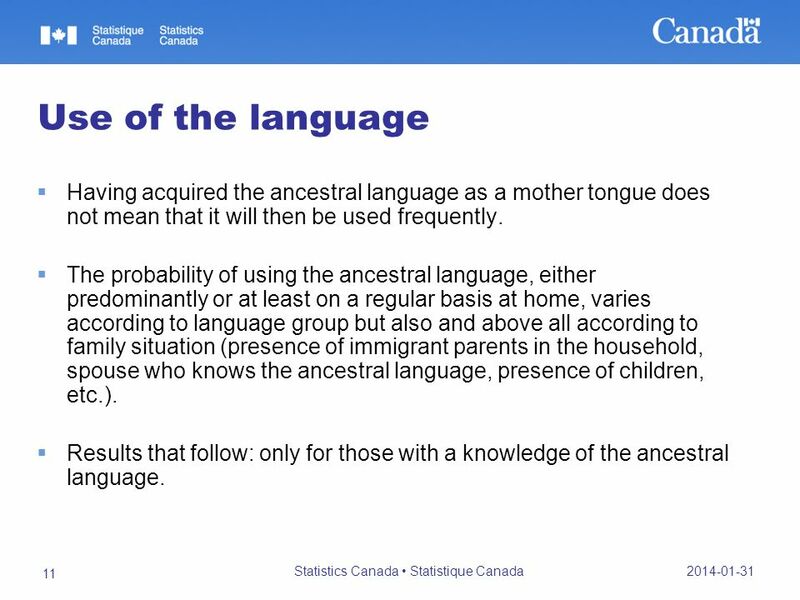 3 2014-01-31 Statistics Canada Statistique Canada 3 Research Questions To what extent have the respondents – persons born in Canada of allophone immigrant parents – acquired their parents mother tongue? 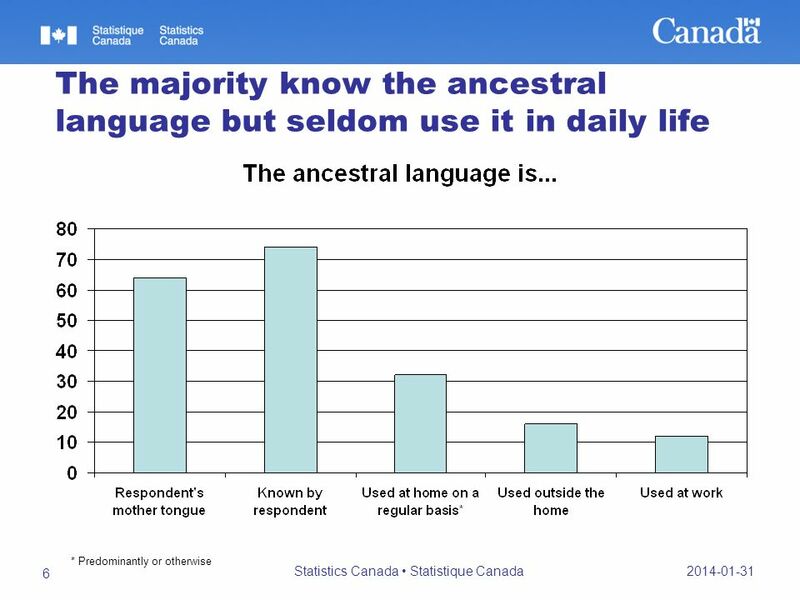 What proportion of respondents know the ancestral language? What proportion use it? 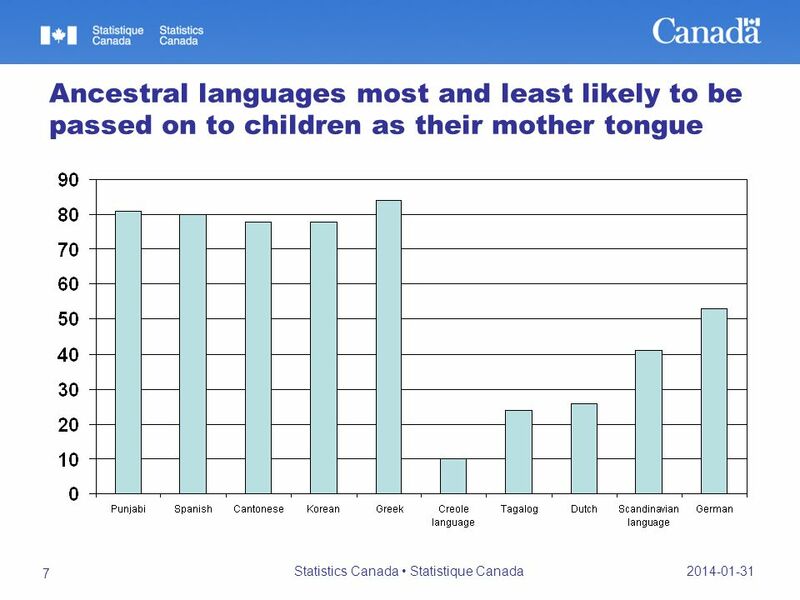 What factors are associated with a fairly strong probability of passing on the ancestral language? Who are most likely to know and use their parents ancestral language at home? 4 2014-01-31 Statistics Canada Statistique Canada 4 Data and Methodology Ethnic Diversity Survey of 2002 40,000 respondents aged 15 and over Selection of the respondents to this survey was based on responses to the 2001 Census questions on ethnic origin and place of birth of individuals and their parents. Target population of the study Persons aged 15 and over born in Canada whose parents were allophone immigrants (i.e., both parents were immigrants with a mother tongue other than English or French). 4,500 respondents, representing roughly 1.25 million Canadians. 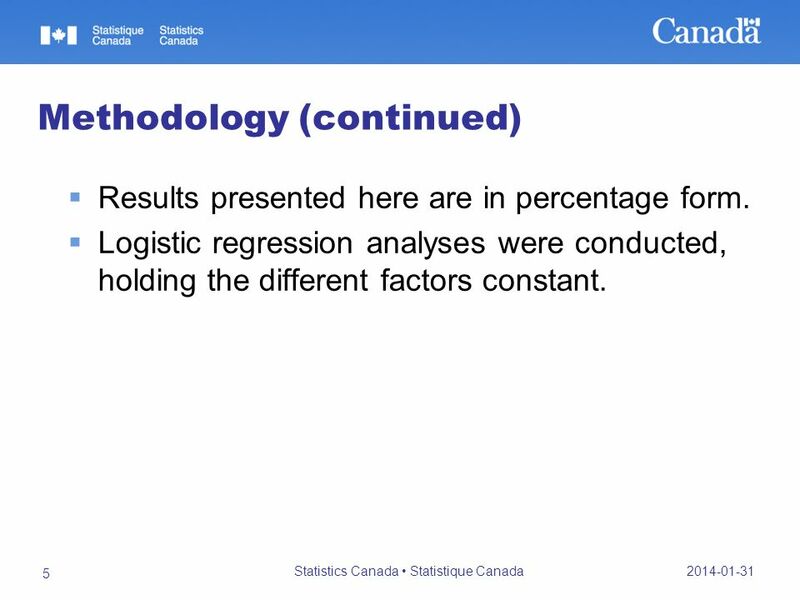 5 2014-01-31 Statistics Canada Statistique Canada 5 Methodology (continued) Results presented here are in percentage form. Logistic regression analyses were conducted, holding the different factors constant. 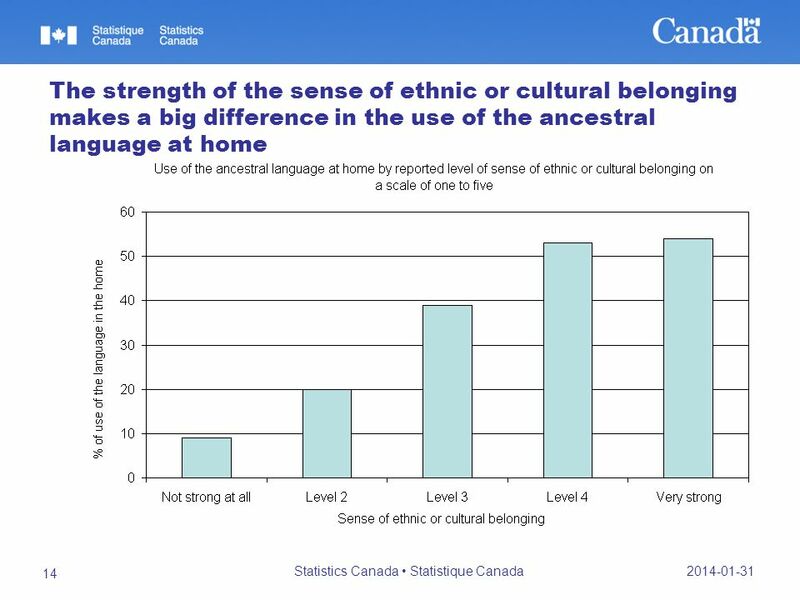 11 2014-01-31 Statistics Canada Statistique Canada 11 Use of the language Having acquired the ancestral language as a mother tongue does not mean that it will then be used frequently. 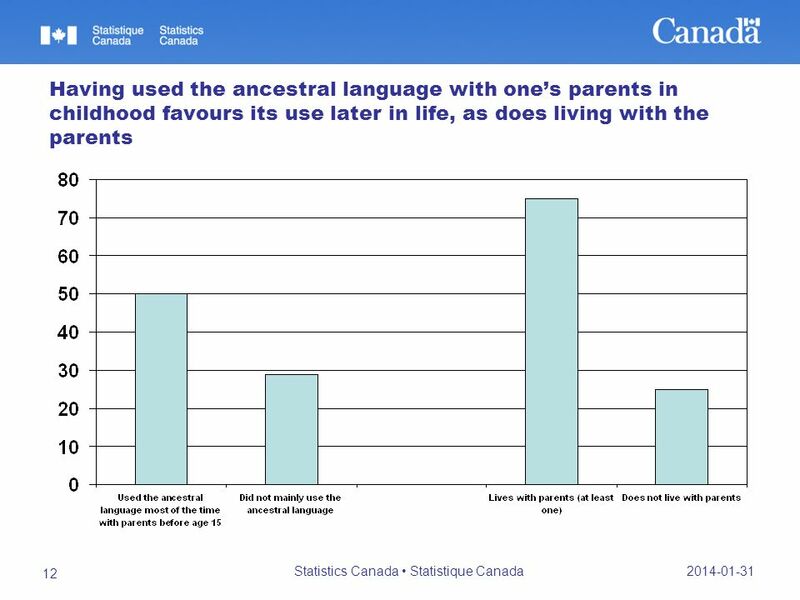 The probability of using the ancestral language, either predominantly or at least on a regular basis at home, varies according to language group but also and above all according to family situation (presence of immigrant parents in the household, spouse who knows the ancestral language, presence of children, etc.). Results that follow: only for those with a knowledge of the ancestral language. 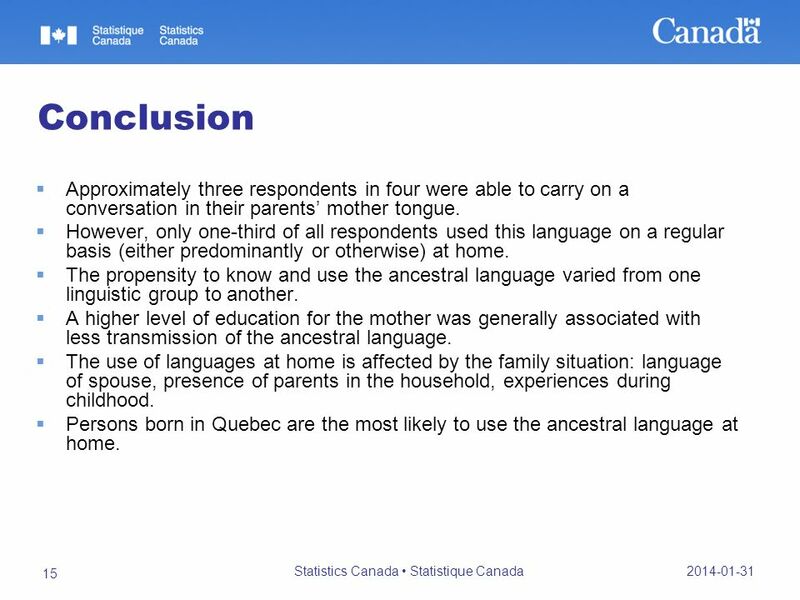 15 2014-01-31 Statistics Canada Statistique Canada 15 Conclusion Approximately three respondents in four were able to carry on a conversation in their parents mother tongue. However, only one-third of all respondents used this language on a regular basis (either predominantly or otherwise) at home. The propensity to know and use the ancestral language varied from one linguistic group to another. 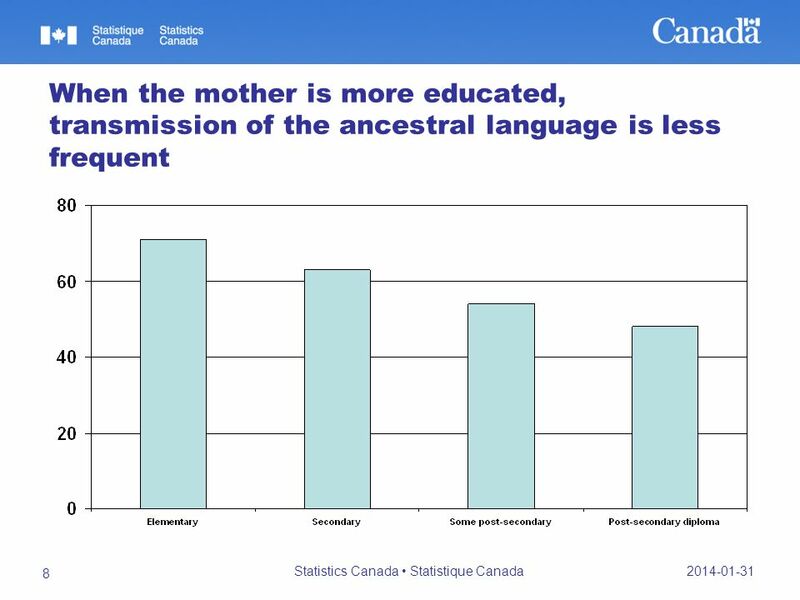 A higher level of education for the mother was generally associated with less transmission of the ancestral language. The use of languages at home is affected by the family situation: language of spouse, presence of parents in the household, experiences during childhood. 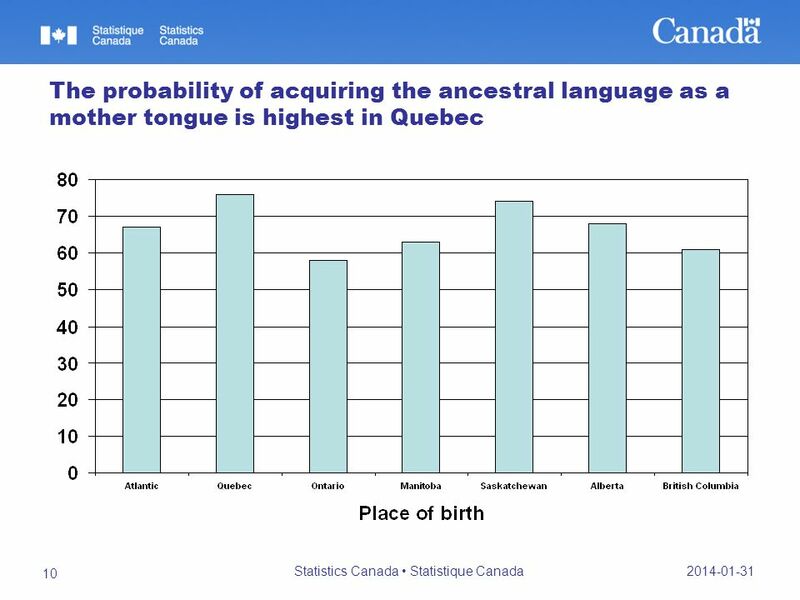 Persons born in Quebec are the most likely to use the ancestral language at home. 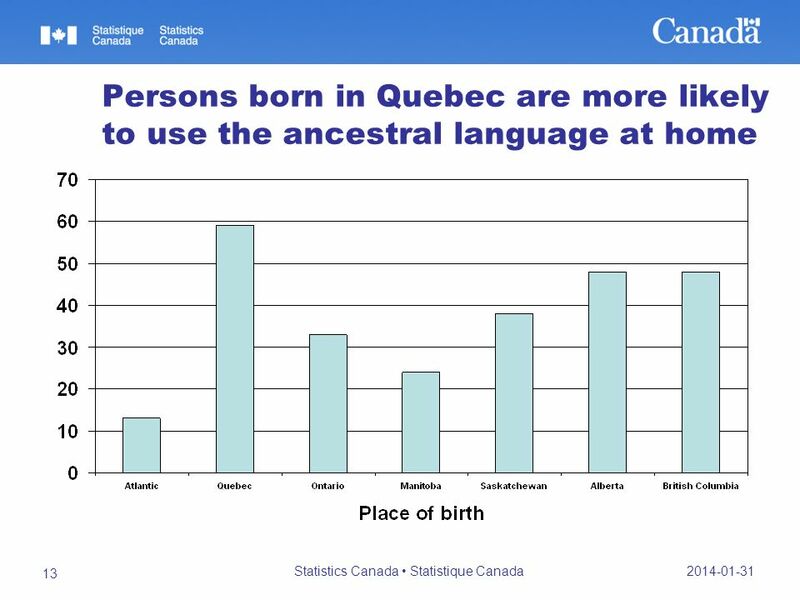 Download ppt "Jean-Pierre Corbeil* Statistics Canada October 22, 2009 Passing on Ancestral Languages * On behalf of Martin Turcotte, Statistics Canada, author of the." PRESENTATION ON THE PREMIUM CABLE VIEWER* AUTHOR/PUBLISHER: Al Berrios, Managing Director, al berrios & co. CONDUCTED: OCTOBER 21ST THROUGH OCTOBER 31ST. Experiences of Discrimination: The Impact of Metropolitan and Non- Metropolitan Location Brian Ray, University of Ottawa Valerie Preston, York University. Statistics Canada data sources available Canadian Community Health Survey (CCHS) Cycle 3.1 Sense of community belonging Ethnic Diversity Survey (EDS) Sense. 1 Persistent Low-Income Among Recent Immigrants By G. Picot F. Hou R. Finnie S. Coulombe Business and Labour Market Analysis Division Statistics Canada. ETHNIC DIVERSITY SURVEY. Survey Objectives to provide information on ethnic diversity in Canada; to provide information to better understand how Canadians. Language in the Workplace Monica Boyd University of Toronto. Joining and Belonging: Language Use and the Civic Participation of Immigrants Monica Boyd University of Toronto. 1 The 2007 National Immigrant Survey (Spain) National Statistics Institute (INE) Antonio ARGÜESO director for social and demographic statistics. Page 1 Measuring Survey Quality through Representativity Indicators using Sample and Population based Information Chris Skinner, Natalie Shlomo, Barry. Undergraduates in Minnesota: Who are they and how do they finance their education? Tricia Grimes Shefali Mehta Minnesota Office of Higher Education November. 1 Positive attitudes are not enough: Minority language survival in the Canadian Prairies Jaya Nagpal & Elena Nicoladis University of Alberta. 1 Pathways to Wellbeing among Teenage Mothers in Great Britain Gender Equality Symposium Cambridge, September 2008 Ingrid Schoon & Elzbieta Polek Institute. Population Trends and Issues. OUR GROWTH! In 1804 there were 1 billion people on the earth. In 1804 there were 1 billion people on the earth. At the beginning.